Kumamoto’s mascot Kumamon is tasked with promoting Kumamoto, but how has a character concerned with advertising holiday hotspots and delicious regional produce ended up lecturing at Harvard or meeting the Imperial couple!? Discover what it is about the bear that makes us love him so. Kumamon? Is that like a Pokemon? Kumamon is Kumamoto prefecture’s yuru-kyara. We’ve chatted a bit before about the amazing world of yuru-kyara in our blog on Mascot Mania!, but sufficed to say Kumamon is one of the most popular and enduring of these mascots. Tasked with promoting local areas, produce or themes (like recycling), most yuru-kyara add a little bit of fun to non-profit events or promotional materials. Kumamon, on the other hand, has managed to become an international sensation, raking in an estimated 124.4 billion yen of revenue for Kumatmoto over 2012-2013 (that’s roughly £728 million pounds!) So what is it about the bear? Many people feel Kumamon is kimokawa, creepy (kimochi warui) + cute (kawaii) , although perhaps not quite as much as Hokkaido’s Melon-Kuma who seems to be quite found of taking a bite out of bystanders (see left). 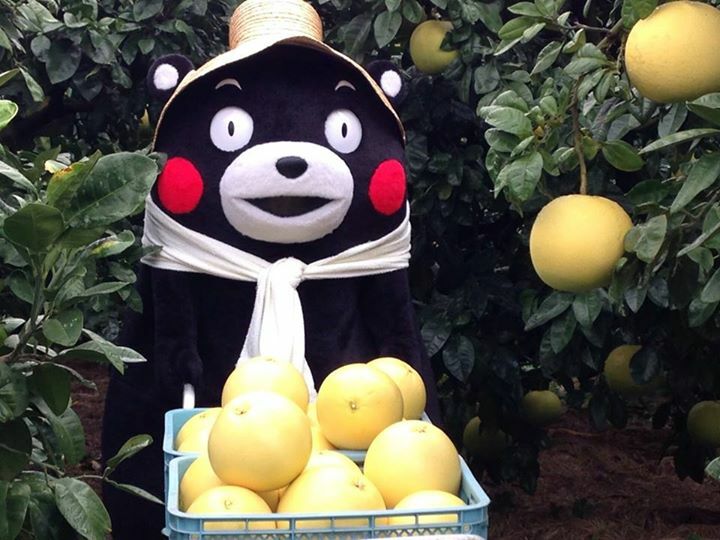 We love Kumamon’s earnestness, whether you thinking he’s plotting to take over the world or just really REALLY loves oranges, Kumamon always seems to do everything 100%! And it’s hilariously endearing. Okay, so we may be a bit biased but Kumamoto is actually pretty nifty. Unlike the yuru-kyara that get lumbered with things like sea cucumbers to promote (we love you too Namapon! ), Kumamoto has a lot to offer. While it may not beat out Kyoto or Tokyo to the top spot of Japan’s no. 1 travel destination, it’s no slouch when it comes to food culture, being the home of Kumamoto style tonkotsu ramen, as well as having taken part in some of Japan’s more dramatic historical events, like the siege of Kumamoto Castle during the Satsuma Rebellion. I ♥ Kumamon! I ♥ Kumamoto! Along with a whole host of other goodies! Posted in Food and tagged kumamoto. Bookmark the permalink.